Pilonidal Cyst Surgery at North Shore Center for Plastic Surgery. The plastic surgeons of North Shore Center for Plastic Surgery in Great Neck, Long Island, NY, are board certified by the American Board of Plastic Surgery and are experienced in both facial and body cosmetic and reconstructive procedures. In addition to their training and experience in general plastic surgery procedures, Dr. Lin and Dr. Cohen-Kashi sub-specialize in Pilonidal Cyst Surgery and have helped many patients who suffer from Pilonidal disease. A Pilonidal Cyst is a non-contagious pocket or sac of tissue that forms on the top of the skin above the tailbone and can form sinus tracts underneath the skin that can become infected and filled with pus (referred to as a Pilonidal Abscess) requiring incision and drainage of the area. A Pilonidal Cyst can fluctuate episodically between a draining and a dormant non-draining state, the latter of which is ideal time for surgical removal of the tissue. 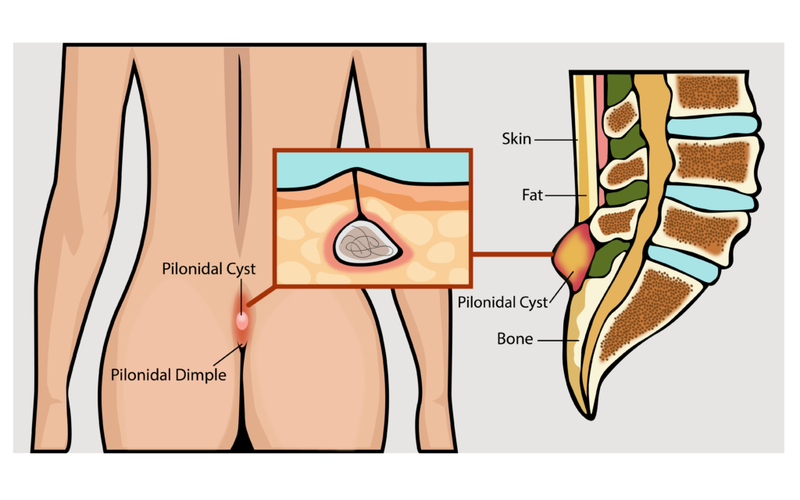 What Causes a Pilonidal Cyst? Doctors are not quite sure what causes a Pilonidal Cyst to form, but the two most common theories are that they are caused by ingrown hairs or trauma to the tailbone region. In fact, when a Pilonidal Cyst or Pilonidal Abscess is removed it’s common to find hair follicles inside the cyst cavity, hence the name “pilonidal” which means “nest of hair”. Who Are Most At Risk of Developing a Pilonidal Cyst? Men: Men are four times more likely to develop a Pilonidal Cyst than women. However, that’s not to say that it’s impossible for women to develop a Pilonidal Cyst. Patients with Thick Body Hair: Because it is believed that a Pilonidal Cyst can be associated with ingrown hair(s) above the tailbone, it is also believed that men with thicker hair may be more at risk. Patients who Routinely Shave Hair Above The Tailbone: Routine shaving of the skin is thought to place men & women at a higher risk because there’s a higher chance of damaging the skin and/or developing an ingrown hair later on. How Does A Doctor Diagnose a Pilonidal Cyst? Dr. Lawrence Lin and Dr. Jacob Cohen-Kashi diagnose patients who believe they have a Pilonidal Cyst first by doing a physical examination. Through the physical examination, the doctors at North Shore Center for Plastic Surgery will determine if the region in question is indeed a Pilonidal Cyst or a Pilonidal Abscess. What is the Treatment for a Pilonidal Cyst? Removing a Pilonidal Cyst involves excising the cyst and any associated sinus tracts underneath the skin. After excising the affected tissue, there may be a large area of missing tissue that requires a flap of tissue from the buttock region to adequately heal the area. Alternatively, if a flap is not performed, the area can take months to heal on its own with local wound care. The Pilonidal Cyst is located in a region of the body that is difficult to heal once removed, and the goal of the tissue flap surgery is to expedite the healing process. Flap surgery is usually performed under general or regional anesthesia and can be performed as an outpatient procedure. Patients go home with a surgical drain that is removed in the office 5-7 days after the procedure. Initial healing of the surgical incisions takes 2-3 weeks. Overall healing to a full active state can take 6-8 weeks. Are Antibiotics Used To Treat Pilonidal Cyst? Antibiotics are used to calm the area when it is an active draining Pilonidal Abscess, and also peri-operatively at the time of surgical excision. Can Patients Have Another Pilonidal Cyst After Surgery? Recurrence of Pilonidal Cysts is not common once excised, but non-healing areas around the site of excision can occur requiring local wound care. If you suspect that you have a Pilonidal Cyst, contact Dr. Lawrence Lin and Dr. Jacob Cohen-Kashi at North Shore Center for Plastic Surgery to setup an appointment.